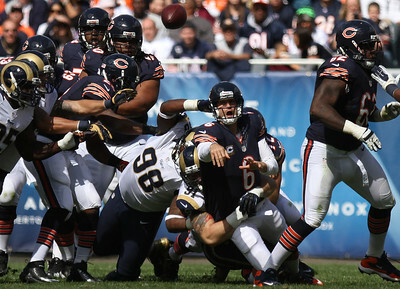 The Chicago Bears (2-1) defeated the St. Louis Rams (1-2) 23-6 Sunday, September 23, 2012 at Soldier Field in Chicago. 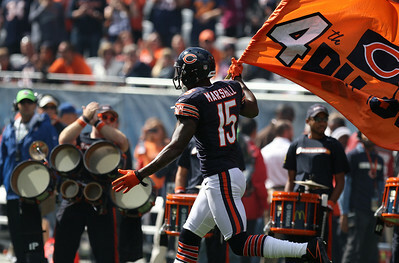 Mike Greene - mgreene@shawmedia.com Bears wide receiver Brandon Marshall carries a flag onto the field before the start of a game against the St. Louis Rams Sunday, September 23, 2012 at Soldier Field in Chicago. Chicago (2-1) defeated St. Louis (1-2) 23-6. 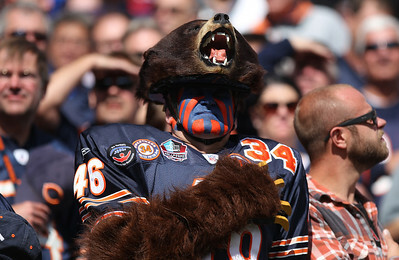 Mike Greene - mgreene@shawmedia.com Don "Bearman" Wachter, of Plainfield, holds his hand/paw over his heart during the national anthem before the start of a game against the St. Louis Rams Sunday, September 23, 2012 at Soldier Field in Chicago. Chicago (2-1) defeated St. Louis (1-2) 23-6. Mike Greene - mgreene@shawmedia.com Bears kick returner Devin Hester returns the opening kickoff during the first quarter of a game against the St. Louis Rams Sunday, September 23, 2012 at Soldier Field in Chicago. Chicago (2-1) defeated St. Louis (1-2) 23-6. 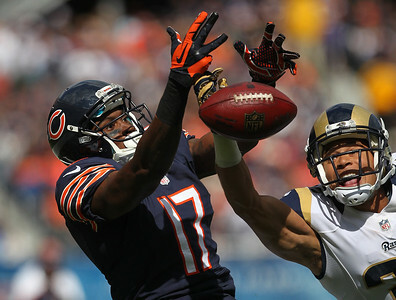 Mike Greene - mgreene@shawmedia.com Bears wide receiver Alshon Jeffery reacts as St. Louis cornerback Cortland Finnegan breaks up a pass during the first quarter of a game Sunday, September 23, 2012 at Soldier Field in Chicago. Chicago (2-1) defeated St. Louis (1-2) 23-6. 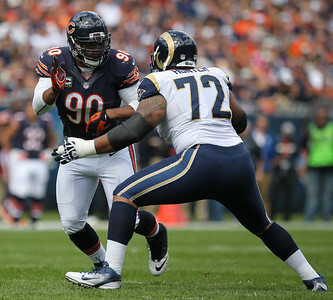 Mike Greene - mgreene@shawmedia.com Bears defensive end Julius Peppers works against St. Louis tackle Wayne Hunter during the first quarter of a game Sunday, September 23, 2012 at Soldier Field in Chicago. Chicago (2-1) defeated St. Louis (1-2) 23-6. 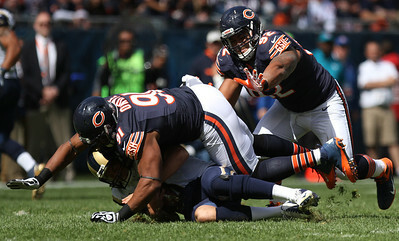 Mike Greene - mgreene@shawmedia.com Bears defensive tackle Amobi Okoye flattens St. Louis quarterback Sam Bradford as teammate Stephen Paea supports during the first quarter of a game Sunday, September 23, 2012 at Soldier Field in Chicago. Chicago (2-1) defeated St. Louis (1-2) 23-6. 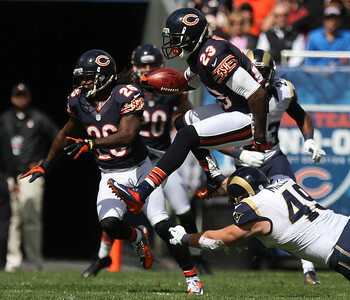 Mike Greene - mgreene@shawmedia.com Bears kick returner Devin Hester hurdles St. Louis' Brit Miller during a punt return in the first quarter of a game Sunday, September 23, 2012 at Soldier Field in Chicago. Chicago (2-1) defeated St. Louis (1-2) 23-6. 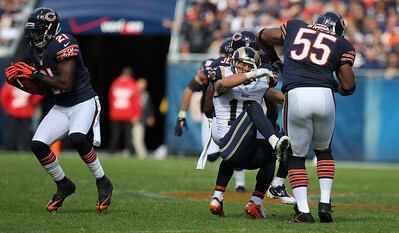 Mike Greene - mgreene@shawmedia.com Bears quarterback Jay Cutler releases the ball while being hit by St. Louis defensive end Chris Long during the first quarter of a game Sunday, September 23, 2012 at Soldier Field in Chicago. Chicago (2-1) defeated St. Louis (1-2) 23-6. 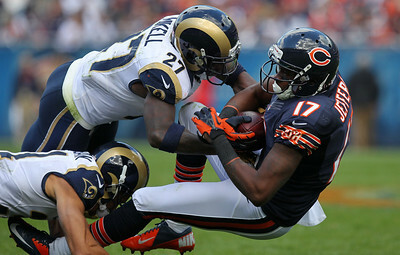 Mike Greene - mgreene@shawmedia.com Bears wide receiver Devin Hester follows a block from teammate Brandon Marshall on St. Louis cornerback Janoris Jenkins during the first quarter of a game Sunday, September 23, 2012 at Soldier Field in Chicago. Chicago (2-1) defeated St. Louis (1-2) 23-6. 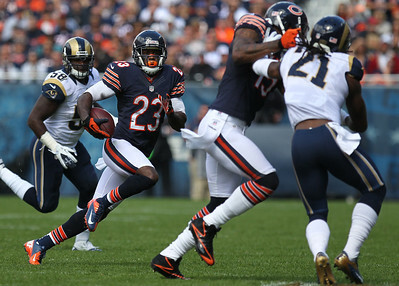 Mike Greene - mgreene@shawmedia.com Bears running back Kahlil Bell breaks into a gap while rushing during the first quarter of a game against the St. Louis Rams Sunday, September 23, 2012 at Soldier Field in Chicago. Chicago (2-1) defeated St. Louis (1-2) 23-6. 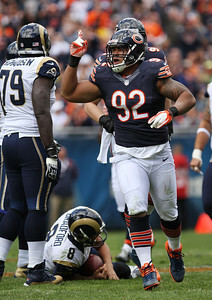 Mike Greene - mgreene@shawmedia.com Bears defensive tackle Stephen Paea celebrates after sacking St. Louis quarterback Sam Bradford during the first quarter of a game Sunday, September 23, 2012 at Soldier Field in Chicago. Chicago (2-1) defeated St. Louis (1-2) 23-6. 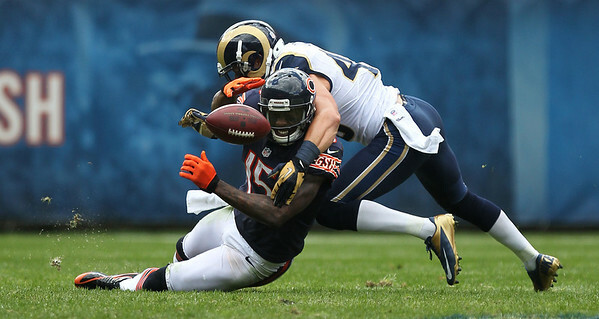 Mike Greene - mgreene@shawmedia.com Bears wide receiver Brandon Marshall is twisted up after being hit by St. Louis safety Craig Dahl during the second quarter of a game Sunday, September 23, 2012 at Soldier Field in Chicago. Chicago (2-1) defeated St. Louis (1-2) 23-6. 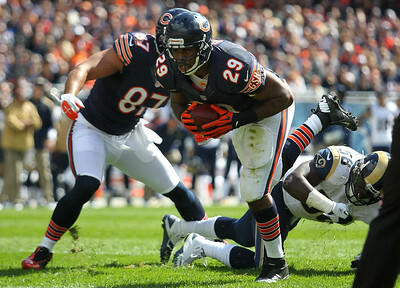 Mike Greene - mgreene@shawmedia.com Bears running back Michael Bush breaks into the endzone for a touchdown during the second quarter of a game against the St. Louis Rams Sunday, September 23, 2012 at Soldier Field in Chicago. Chicago (2-1) defeated St. Louis (1-2) 23-6. 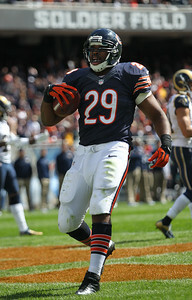 Mike Greene - mgreene@shawmedia.com Bears running back Michael Bush reacts after scoring a touchdown during the second quarter of a game against the St. Louis Rams Sunday, September 23, 2012 at Soldier Field in Chicago. Chicago (2-1) defeated St. Louis (1-2) 23-6. Mike Greene - mgreene@shawmedia.com Bears linebacker Brian Urlacher takes defensive signals from the sideline during the third quarter of a game against the St. Louis Rams Sunday, September 23, 2012 at Soldier Field in Chicago. Chicago (2-1) defeated St. Louis (1-2) 23-6. 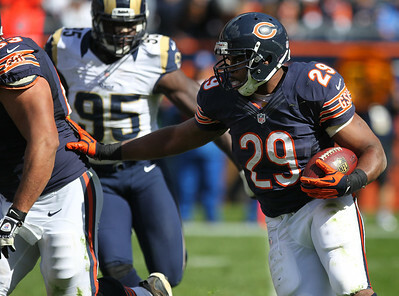 Mike Greene - mgreene@shawmedia.com Bears running back Michael Bush pushes teammate Roberto Garza while rushing during the third quarter of a game against the St. Louis Rams Sunday, September 23, 2012 at Soldier Field in Chicago. Chicago (2-1) defeated St. Louis (1-2) 23-6. 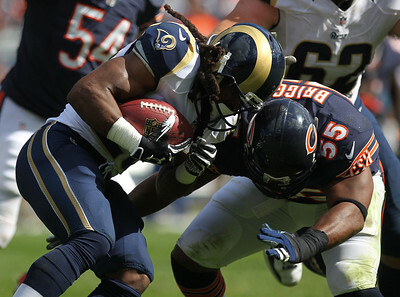 Mike Greene - mgreene@shawmedia.com St. Louis running back Daryl Richardson is hit by Bears linebacker Lance Briggs during a rush in the third quarter of a game Sunday, September 23, 2012 at Soldier Field in Chicago. Chicago (2-1) defeated St. Louis (1-2) 23-6. 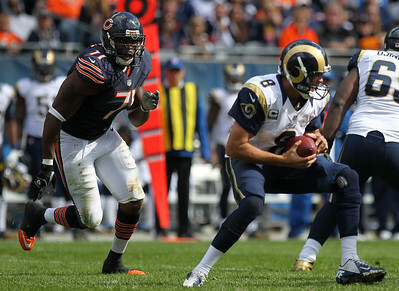 Mike Greene - mgreene@shawmedia.com Bears defensive lineman Israel Idonije closes in on St. Louis quarterback Sam Bradford during the third quarter of a game Sunday, September 23, 2012 at Soldier Field in Chicago. Chicago (2-1) defeated St. Louis (1-2) 23-6. 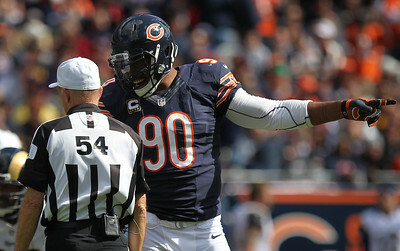 Mike Greene - mgreene@shawmedia.com Bears defensive end Julius Peppers complains to an official during the third quarter of a game against the St. Louis Rams Sunday, September 23, 2012 at Soldier Field in Chicago. Chicago (2-1) defeated St. Louis (1-2) 23-6. Mike Greene - mgreene@shawmedia.com Bears wide receiver Alshon Jeffery falls back after being hit by St. Louis safety Quintin Mikell and cornerback Cortland Finnegan during the fourth quarter of a game Sunday, September 23, 2012 at Soldier Field in Chicago. Chicago (2-1) defeated St. Louis (1-2) 23-6. 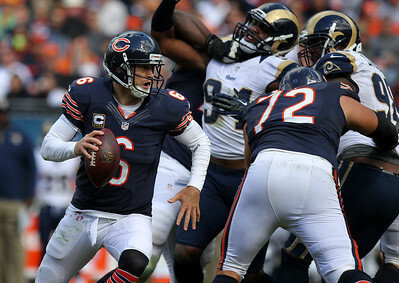 Mike Greene - mgreene@shawmedia.com Bears quarterback Jay Cutler scrambles during the fourth quarter of a game against the St. Louis Rams Sunday, September 23, 2012 at Soldier Field in Chicago. Chicago (2-1) defeated St. Louis (1-2) 23-6. 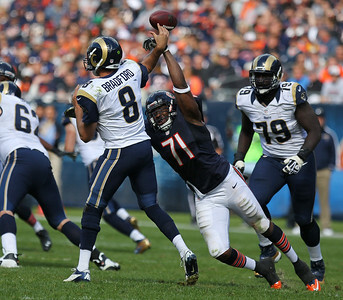 Mike Greene - mgreene@shawmedia.com Bears defensive lineman Israel Idonije breaks up a pass by St. Louis quarterback Sam Bradford during the fourth quarter of a game Sunday, September 23, 2012 at Soldier Field in Chicago. Chicago (2-1) defeated St. Louis (1-2) 23-6. 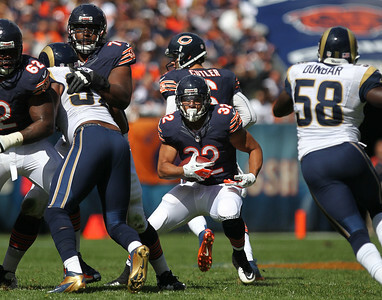 Mike Greene - mgreene@shawmedia.com Bears safety Major Wright (left) holds onto an interception as teammate Lance Brigges (right) knocks St. Louis wide receiver Danny Amendola off his feet during the fourth quarter of a game Sunday, September 23, 2012 at Soldier Field in Chicago. Chicago (2-1) defeated St. Louis (1-2) 23-6. 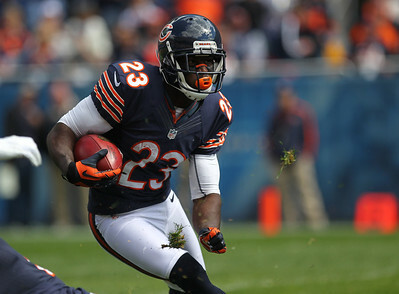 Mike Greene - mgreene@shawmedia.com Bears safety Major Wright runs in the open after intercepting a pass during the fourth quarter of a game against the St. Louis Rams Sunday, September 23, 2012 at Soldier Field in Chicago. 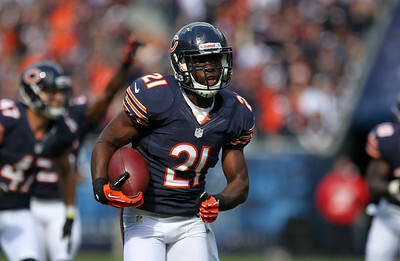 Wright took the interception back for a touchdown, helping Chicago (2-1) defeat St. Louis (1-2) 23-6. 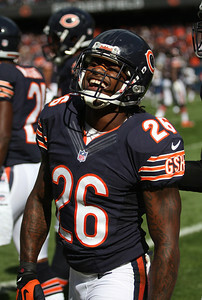 Mike Greene - mgreene@shawmedia.com Bears cornerback Tim Jennings reacts after a touchdown by teammate Major Wright on an interception during the fourth quarter of a game against the St. Louis Rams Sunday, September 23, 2012 at Soldier Field in Chicago. Chicago (2-1) defeated St. Louis (1-2) 23-6. 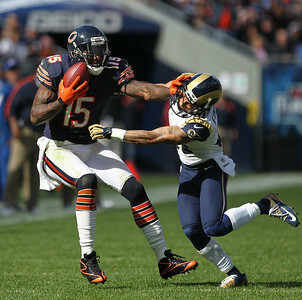 Mike Greene - mgreene@shawmedia.com Bears wide receiver Brandon Marshall pushes away from St. Louis cornerback Cortland Finnegan after a reception during the fourth quarter of a game Sunday, September 23, 2012 at Soldier Field in Chicago. Chicago (2-1) defeated St. Louis (1-2) 23-6. 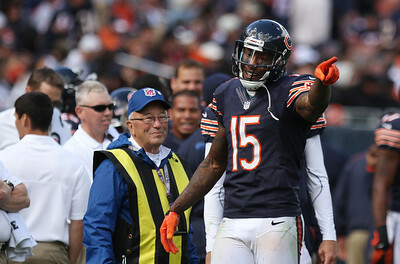 Mike Greene - mgreene@shawmedia.com Bears wide receiver Brandon Marshall complains to an official during the fourth quarter of a game against the St. Louis Rams Sunday, September 23, 2012 at Soldier Field in Chicago. Chicago (2-1) defeated St. Louis (1-2) 23-6. 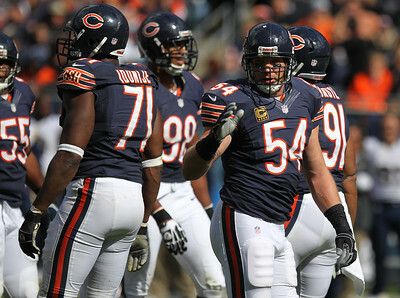 Bears linebacker Brian Urlacher takes defensive signals from the sideline during the third quarter of a game against the St. Louis Rams Sunday, September 23, 2012 at Soldier Field in Chicago. Chicago (2-1) defeated St. Louis (1-2) 23-6.